A new report by the Institute on Taxation and Economic Policy (ITEP) and AASA, the School Superintendents Association, details how tax subsidies that funnel money toward private schools are being used as profitable tax shelters by high-income taxpayers. By exploiting interactions between federal and state tax law, high-income taxpayers in nine states are currently able to turn a profit when making so-called donations  to private school voucher organizations. The report also explains how legislation pending in Congress called the Educational Opportunities Act (EOA) would expand these profitable tax shelters to investors and corporations nationwide. As things stand today, this tax loophole is only available to taxpayers in nine of the seventeen states with private school voucher tax credits. But the Educational Opportunities Act (EOA) introduced by Sen. Marco Rubio (FL) and Rep. Todd Rokita (IN) would open up entirely new profit-making schemes to investors and corporations nationwide. The EOA would offer a 100 percent tax credit of up to $4,500 for individuals or $100,000 for corporations donating to fund private school vouchers. Under this system, investors choosing to donate stock (or other property) rather than cash to voucher organizations would find that doing so would be more lucrative than if they had simply sold the stock and kept the money for themselves. This is because rather than receiving (taxable) capital gains income from a buyer of the stock, the investor would be paid in (tax-free) federal tax credits. Another potential tax shelter would be limited to those taxpayers living in states offering their own voucher tax credits. 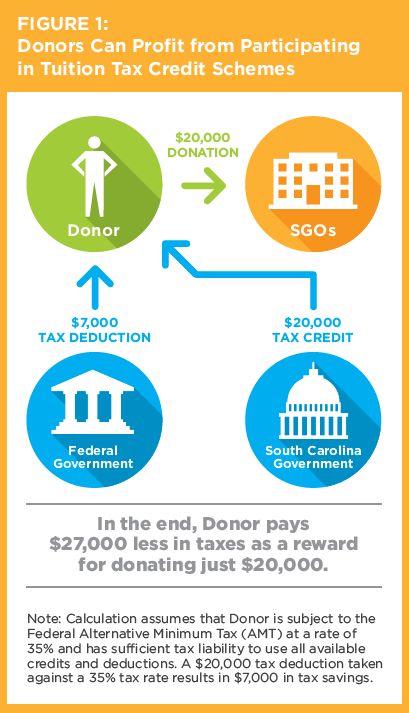 While the EOA prohibits claiming a federal tax deduction and federal tax credit on the same donation, it is silent as to whether taxpayers can claim a state tax credit and federal tax credit on a single donation. If this occurred, taxpayers would enjoy a guaranteed profit every year they donate to private schools when they stacked 100 percent federal credits on top of state credits valued at 50 to 100 percent of the amount donated. Wealth managers and tax accountants would be foolish not to advise their clients to take advantage of these handouts. Even families with no particular attachment to private schools would find it to be in their own financial best interest to begin donating to those schools. The result could be an explosion in funding for private schools at the expense of the public coffers and everything they fund including public education.